I had a blast making this card. I got to use a stamp set that I see all over the place, but do not own personally. 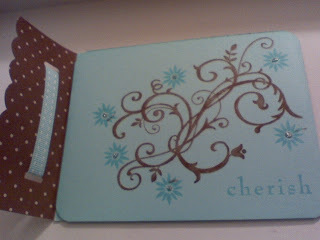 This card opens to the right- that Close to Cocoa flap DSP is on the entire back, and is home of the ribbon. I am happy with the outcome. I used it as an ALL OCCASION swap I recently did. Ice spickles glitter, corner rounder punch. 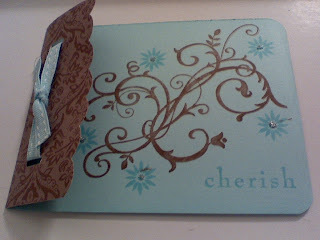 This is a beautiful card...love the colors. I love that set! I will NOT be selling it EVER!